There was a call for participation from Hermann Meyer, the main developer of Guitarix, for creating a new user interface for his very cool project. It may create the impression that I don’t know how to spend my days but I couldn’t resist to get in touch with him to talk about his wishes and preferences. Fortunately he had enough trust to give me a carte blanche so I started thinking about a visual concept. Earlier this day I sent him an export of my very first steps in Inkscape and it seems it met his expectations and preferences. He gave me commit access to the SF git repo so I’ll start implementing stuff as soon as my scribbles reach a mature state. Don’t expect that things are done next week since the image represents a quit early stage of brainstorming. 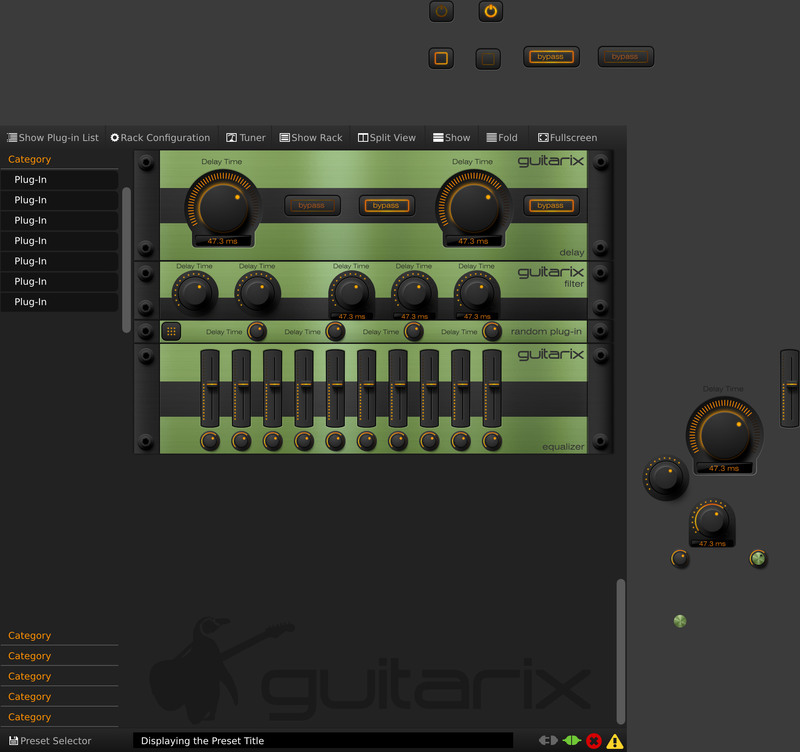 In addition Guitarix is in a rather advanced state and offers a quite complex user interface so realization will take its time. But it’s a start at least. This article was published Dienstag,, 24. Februar 2015 @ 22:32. You may want to subscribe to the comments via RSS 2.0 feed. Post a comment, or create a trackback on your page. I’m very happy that you decided to join the Guitarix project and help with the UI. I think your work with Calf is awesome and I believe that Guitarix will climb a step with your contributions! thanks a lot! Hopefully I’ll cope with the advance praises. Hi Markus, I just want to thank you for this awesome GUI. Greetings from Montevideo city, Uruguay (yep, it come just that far !) Really, thank you for your hard work. It’s a pity it is not available into Ubuntu’s nor Mint’s repository yet (and those are mainstream linux) I had to compile it myself but it was worth, the new GUI is far more beautiful and furthermore, it improves the usability a lot.